I enjoy yardening. That’s 3 parts lawn work, 2 parts gardening, mixed with equal but liberal amounts of dirt, sweat, rain, and sunshine. 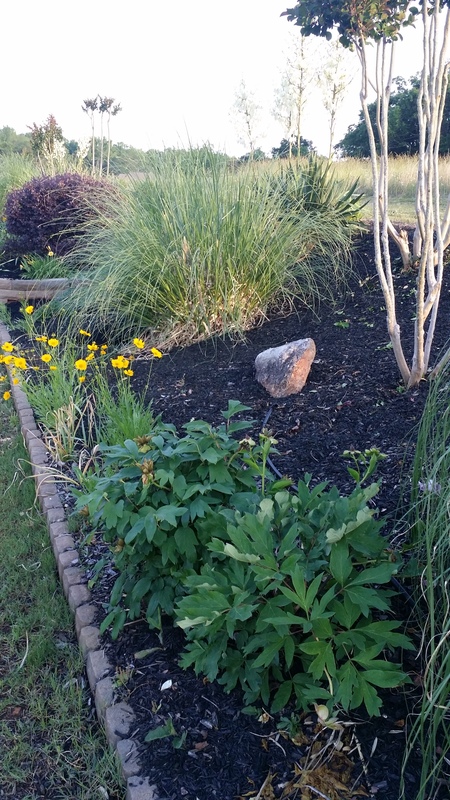 The other day my wife was making me proud mowing the grass while I shoveled mulch onto the flower beds. 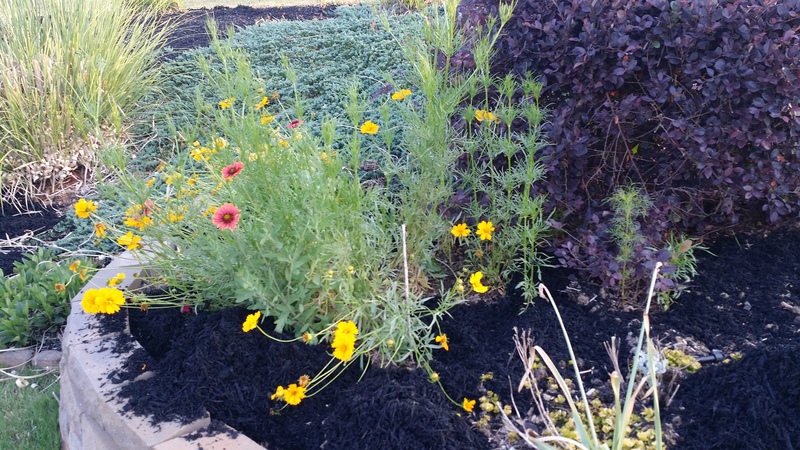 When she finished she walked over and commented on a group of wispy yellow flowers growing in one of the beds. I looked and it suddenly struck me, these were flowers that had come back from last year’s wild flower patch. During the late winter when I made my first weeding round, I had almost pulled them up, but hesitated when I saw how they were bunched in the same place I had planted wildflowers last spring. This afternoon was the first time I had thoughtfully returned to those plants (9 straight weeks on the road will do that to you). Obviously I was delighted. As I pondered the flowers the thought stuck me, “these are from seeds you planted.” In the wonder of that moment I realized that this was a nudge from the Lord. I serve on the Care Team at our Church. Dozens of volunteers meet with and minister to dozens of people every Sunday listening, loving, and caring for persons who need to know someone cares and especially that God cares. Having been in a number of those conversations, I am intensely aware of how dependent I am on the Lord to provide the wisdom and Godly counsel that people need. I can comfortably do the ‘listen, empathize, and love on people’ part. It is how the Father has wired me and trained me. But I don’t want to speak words that simply parrot clichés or worldly wisdom. The practice of being quick to listen, quick to love, and slow to speak has proven to be an apt approach in care-giving for me. For when I listen and love, the Holy Spirit either brings nuggets of wisdom from His Word OR He brings another person into the conversation who has that word. In some cases the words of guidance I give are few, but the prayer that I am able to confidently offer is 0ften my primary contribution. As I watched the flowers wave in the afternoon breeze I had a mental picture of the lives that the Lord touches through faithful care-giving. While our care team has a specific time and place where we join in God’s work each Sunday, the reality is we have these opportunities throughout our week. On some occasions we get to see the great work God does in a person, marriage, or family. In other instances our follow up is limited to just a few contacts. However, when we are faithful we can rest assured God is continuing the work. And our joy knows no bounds. Be blessed today my friend. And be a blessing. As I have shared before, I am an engineer. So much so that my wife struggles not to roll her eyes as she says it. My natural inclination is to observe, analyze, and critique. This mindset helps me solve problems and improve processes. However by themselves they are not conducive to building strong, vibrant, loving relationships. Through the years though I have changed. I still have these attributes, but they have been tempered. And I am a better person for it. I am very thankful for my parents. They strove to raise my siblings and I right. They taught us manners, respect for all people, putting other’s needs ahead of my own, and the importance of family. They took us to church and established a pattern of faithful attendance. They disciplined me when I strayed, but at the end of the discipline was always a hug and words of affirmation. My parents established an excellent foundation for the transformation. As I have recounted in an earlier post, I strayed significantly through my college years, trying new and formerly forbidden things. I was a person swimming further and further from shore. But God did an amazing thing. He brought me to a place where I could clearly see the two choices I had. I could continue my life of swimming in deep water and being my own master or I could chose to follow Him completely. It’s funny because He did not threaten me with bad stuff if I chose not to follow Him. He just indicated that life “All In” with Him would mean He would never leave me or forsake me. I accepted His offer and a change took place immediately. God put His Spirit within me and I knew it. I look at that weekend and that afternoon visit to the chapel at Camp Hartner in Louisiana as my second birthday. I mention all of this as background though. While God entered my life in a real and tangible way at that time, a lot of my ingrained habits and thought patterns were still influenced by the worldly patterns I had become comfortable with. The Holy Spirit had been active in wooing and encouraging me to take the step of faith before my conversion. When I accepted Jesus as my Lord, the Holy Spirit began the work in me that has led to much positive change such as the transformation of a fairly rigid engineer into a relatively relational person who happens to have some engineering skills. Read the Word and Seek the Lord Early Every Day. Start the day in prayer and quiet reflection on Who God is. Talk to Him and let Him speak to you through the bible. Select a good, short devotional to supplement your prayer time. My wife and I have been blessed time and again with the short devotionals found in the devotional Jesus Calling by Sarah Young. I have experimented with doing this at other times of the day, but I have found that dedicating my first hour or so to the Lord has the greatest impact and seems to flavor the rest of the day with a sweet sense of His nearness. Develop Close Faith Friendships and Encourage One Another. While this needs to be within your family too, it actually must include a few close friends. I’ve dived into this topic at length in a previous post, but it is vital that we have people we trust who can be Christ’s hands, feet, and heart to us in times of need. And we in turn will have times when the Lord uses us for others. God did not intend for us to do life alone. When He looked at Adam in the garden He said it was not good for him to be alone. That is true of believers. God knows we need faithful fellowship. Ask Him and He will lead you to those people who will become your faith friends. Join the Church and Plug In. Jesus died for the Church, so the Church is very important to Him. Find a Church that is vibrant. One that consistently points to Jesus and what He is doing. Look for signs of Jesus actively working within the Church. Signs such as growth in numbers, bondages broken, lives being transformed, consistently maturing fellowship, regular outreach beyond the walls of the Church, and joy in following Jesus. Once you find this Church then get involved. Consider your gifts, talents, and passion and see where you can put them to work in the Church. Bloom Where You Are Planted. God has put you in a place to be His ambassador. The life you live is a reflection of where you are in your walk. Jesus desires to use each one of us in the redemption of this world. If you are in a hard place, a difficult place, the light and love of Jesus will stand-out more than ever. Every believer is called to minister in Jesus’ Name. Some of that ministry may be within the Church, but my experience indicates that the greatest need and most frequent opportunities are outside the walls of the Church. Make this a topic in your quiet time with the Lord, asking Him to guide you to the person(s) you are to speak to that day. Remember, it’s All About the Relationships. Jesus left His place in heaven and entered mortal life so He could relate to us, so He could establish a relationship with us. He loves us so much that He took our place when sin, our sin, was judged and executed on the cross. And because of that we can live in intimate relationship with Him. And He wants us to value the relationships that we have with others. Because they matter to Him, they should matter to us as well. As we grow closer to Jesus, we will begin to see others as Jesus sees them. And we will love more and more like Jesus loves. Have a blessed day today as you grow in your life with Jesus. 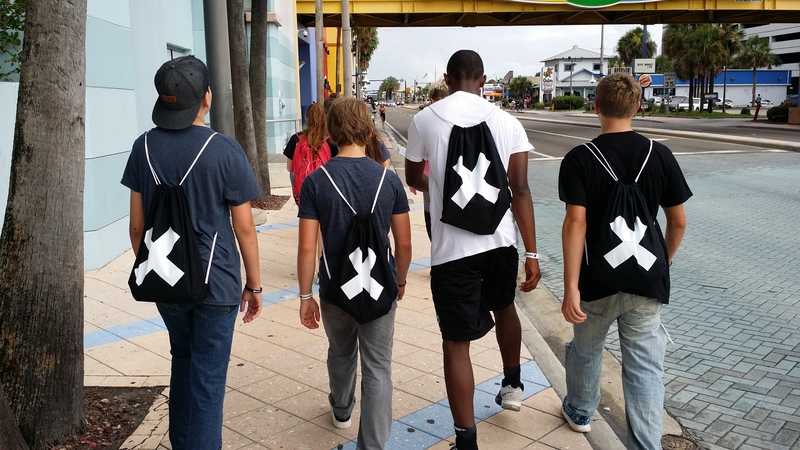 God changed the trajectory of thousands of lives last week at Gauntlet X. Over 4500 youth and 1300 volunteers descended upon Daytona Beach, Florida and we celebrated God’s great love in a most amazing way. 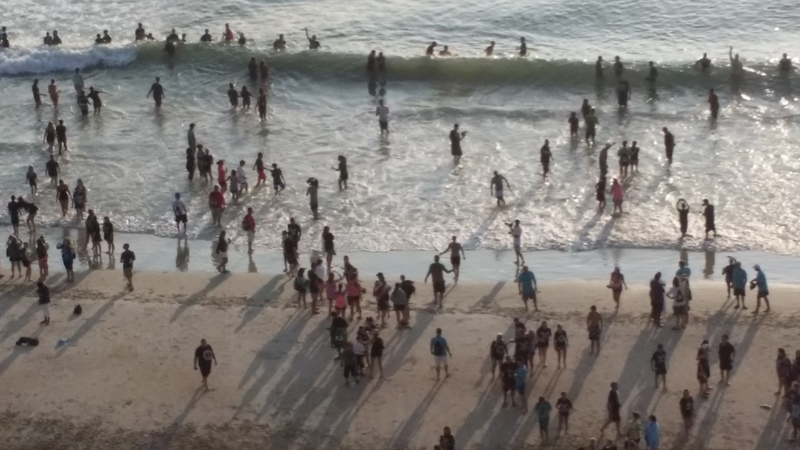 As of Thursday afternoon 1062 people had accepted Christ as their savior and 1529 had been baptized in a mass ocean baptism at sunrise Thursday morning. But it didn’t stop there. God continued to move on the bus rides home. In some buses the open mic was used and as young people gave their testimony to what God had done, what He had delivered them from, what He had saved them from, then remaining hold-outs were drawn to accept Christ as their Lord. I heard of two buses that had nine saved on one and ten saved on another. Amazing! This hits near to my heart on a number of fronts. I came to faith at age 23 at a retreat so I can definitely relate to going away and coming back a changed person. I then worked as a youth volunteer for about 10 years until my work demands and family obligations became too much and the youth work had to be set aside. In a way it felt like slipping into something warm and familiar chatting with the young people, hearing the earnestness in their voices, answering questions that as an adult we don’t often spend a lot of time on, but as teenagers they seem all-important. The Wednesday night service will remain etched in my mind forever. After a simple, straight-forward message Pastor P gave an altar call. It appeared like close to 300 responded. We then began celebrating what God had done. 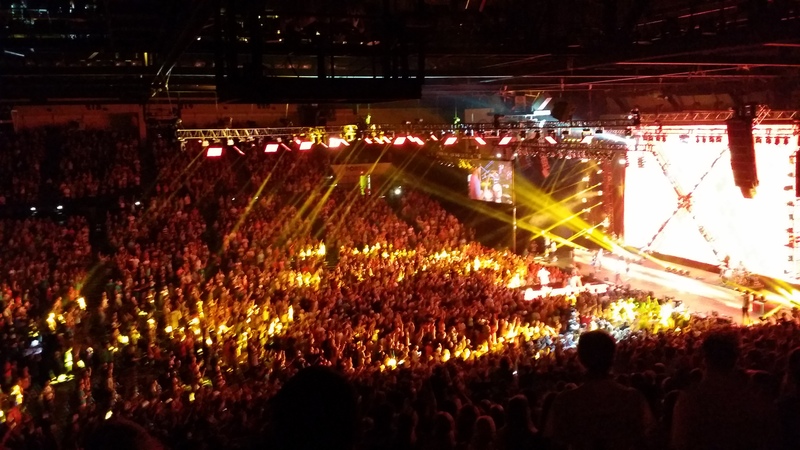 For 5 – 6 solid minutes the 6000 of us left shouted and clapped and praised the Lord. And then the miracle began. Even though the volume was tremendous and constant we heard a burst of shouting above the din. Another person had stood to go forward. A few seconds later another stood. The clamor continued but as we watched every 5 – 15 seconds another person would rise and go forward. This went on for another 30 minutes. It was the most amazing thing. There was no prompting from the stage. No impassioned pleas from Perry. Just loud, heartfelt, sustained praise of the Most High God… and the Spirit of God moved. We saw the manifestation of the verse, “The Lord inhabits the praises of His people.” Someone kept track and said Perry preached for 41 minutes and the altar call then lasted for 52 minutes. In reality the Holy Spirit continues to move from that event as many more have given their lives to Christ since then. As I ponder the impact of what God has done and pray for my young friends who have crossed from death to life I am awed. God has changed the trajectory of so many lives. Lives that were headed down dead-ends are now turned and heading on the right road, the road of God’s choosing. In some, self-loathing and destruction has been replaced with life and joy. In others, a self-centered heart has been made new and is being shaped by the Spirit of God to be God-centered and Others-centered. I am convinced the changes will be profound. The ripples of this move of God will impact families, schools, churches (not everyone who comes is from our church), communities, our state, our nation, and the world. There were four persons who traveled here from Israel to attend. One, a young man named Israel, gave His life to Christ and became a completed Jew, one of the Jewish faith who now recognizes that Jesus is the Messiah his people have been waiting for all these years. Halleluiah!!! As I have prayed about the significance of what God has done, I am thoroughly convinced that this move of God is not a stand-alone, one time event. It is fit into His plan of rebirth and renewal for His people around the world. I find it hard to contain my enthusiasm for what God is doing and going to bring forth. What politicians, governments, advocacy groups, and various well-meaning citizens have tried to do, God, by His Spirit moving in a receptive and obedient people will accomplish. He may use some of those groups above, but true, lasting change comes from the Spirit of God moving in individual lives, united with other changed lives, becoming a move of God that transforms society. I believe that course correction is underway. Please join me in praying for God’s grace to be manifest in lives, families, churches, communities, our state, nation and around the world. Be blessed today and be a blessing as the Father uses your love, your gifts, and your obedience to impact the world right where you live. My new friends as we head to the first session on Monday night. Over 6100 filled the Ocean Center in Daytona Beach experienced God’s grace in a mighty way. 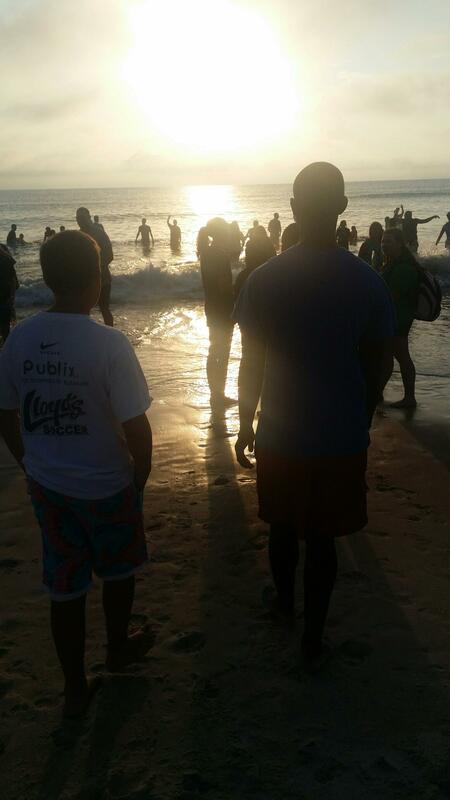 My new friend, Jaylen, heading into the surf for his baptism. 1529 people publically declared their allegiance to Jesus Christ as their Lord in baptism. For 1500+ baptisms it took over 2 hours to coordinate and baptize. I hearkened back to the Day of Pentecost when 3000 were added to the Church in one day. Do you have a specific calling from the Lord? All followers of Jesus have the great commission which applies to the Church universal and we each have a gift or gifts that God has given us for the proclamation of the Gospel and the edification of the Church. However, I suspect that many of us are uncertain whether we have a specific calling from the Lord. You see, this morning it just became very clear to me what my calling is even though I have been a follower of Jesus since 1983. The fact that I just received this crystal clarity doesn’t mean I have not walked in my calling. As I think of the times in my life that I have felt the most joyful, the most fulfilled, they have been when I was walking in my calling. Before I go further I will tell you that my calling is to be an Encourager. You see I had the notion I was waiting for God to call me into the ordained ministry. I loved Him. I thrilled at reading and sharing the Word. And I desperately wanted people to experience the new life in Christ, the abundant life in Christ that I had found. My vision of calling and ministry was fairly narrow and was confined to becoming a minister in a church. Even as my understanding grew, I did not grasp the fact that I had a calling and, with some degree of consistency, I was walking it out. So the point of today is simple. God has a general calling on your life which is to honor and glorify Him, but He also has a specific call on your life. The following steps will help you find your specific calling. 1) Begin by asking Him to guide you and use you. As you lean on and trust in Him, He will lead you to your calling. 2) What are you passionate about? What brings you the greatest joy? For myself and for many others, we are most alive and impassioned when we are doing what God has created us to do. 3) What are you good at? The talents we possess are gifts from God. They are given to us, first and foremost, to glorify Him. They generally also help to provide for us, although that is not always true. An example comes to mind. Early in my faith walk, I told God I would gladly go into the mission field. I pictured using my engineering skills during the day to help people in a third world country build wells and construct homes by day followed by bible studies and preaching at night. But the call for me to actually go into foreign missions has not yet come. It seems likely to me that one of the reasons is my struggle with languages. For some, like our youngest children and my cousin Richard, languages come very easy, but not for me. In lieu of actually going overseas on foreign missions, we have been able to support and encourage others who have that calling. 4) What do other people compliment you on? Sorry, while this can include your mother, it has to be more than just her. When we walk in our giftedness, it will bless others and some of those people will let you know. I am not talking about stroking our vanity, but words of affirmation that we are doing what we are supposed to be doing. Our calling will in some way support the Great commission – the growth and building up of Christ’s body in the earth. Don’t limit this to just the preaching and teaching of the Word though. I know God is the great physician who ultimately heals us, however He most often uses doctors and health professionals to be His agents of that healing. The difference between a person who is walking in their calling as a medical professional and a person who does not recognize what they do as a ministry is the motivation. One seeks to minister to people and meet their needs through God’s strength and provision. The other does not have this foundational truth driving them. I have heard of doctors who pray with their patients through the healing process. To me that is a great indicator that they are walking in their calling. Just because you have a specific calling does not mean that these are the only ways God will use you. He is the omnipotent Creator of the universe. If you are available and obedient He is more than able to give you the grace in any and every situation you find yourself. However, recognizing your calling and seeking to put yourself into positions to grow and use the talents you have is a sure path to fulfillment in God’s amazing economy. Have a blessed day today and may you flourish in the place where God puts you. A group of friends from work decided to commit to one another to pray for our company and co-workers. This blog is an outcome from that effort. While this began as a Lenten discipline leading up to Easter 2011, several of us found so much encouragement in the shared journey that we have decided to continue to pray with and for one another. Below is the initial posting that we shared. I will also add a few other posts from that time, but for the most part I will share new material. I have no idea who else might read this, but I hope that whoever joins us will either be encouraged in their walk with Christ or will be intrigued to enough to seek the One that we acknowledge as God Incarnate – Jesus Christ. A few weeks ago as I was praying, I sensed that I was to make a special prayer effort during the lead up to Easter. I am going to be more specific about praying for our company, or more precisely the persons within our company in their many different places and needs. As I have allowed the idea to take shape I have thought of each of you. I am asking you to consider partnering with me in this season of prayer. This will begin Wednesday, March 9 and go through Easter. Since I accepted this “nudge” from the Lord, several things have occurred which give me specific items to pray for. The CP machine shutdown and the many persons affected by it…The announcements of significant amounts of other market downtime which reflects the difficult markets we live in…Labor -Management discord at several of our sites with P and FF being two with very specific needs at this moment…Health struggles by some of our co-workers…And over all this is the continual need of many that we work with to know the love and forgiveness that our Father offers in and through His Son, Jesus. Here is what I am planning to do and I offer it up to you as potential ideas for you to consider. I am going to pray a hedge of protection around the persons working in our company that they would be safe and live lives that bring them to meet Jesus…before it is too late. I will pray for the leaders of our company and our mills, that they would have the wisdom and guidance to make good decisions. I will pray for those who are experiencing life disruptions because of the difficult work situations such as mill closings or multiplied workloads. As many of you have probably seen, these life disruptions are often the mechanism the Lord uses to get our eyes on Him. I am going to lift up the persons within the company who are battling illness, difficulty, and loss. I will lift up my brothers and sisters in the Lord that we might be faithful, consistent, obedient children of our heavenly Father. I do not want this to feel in any way like compulsion on my part. If this is not something you are comfortable with, I respect and accept that. This is going out as a blind copy initially since some of us will likely not be in a position to commit to this at this time. I do not mind you asking others if they would like to participate, however I do have a couple of specific requests. First, I believe that I, and whoever participates, must be respectful of our company’s rules and guidelines (to the extent they do not violate a clear writ of scripture). That being the case, this will probably be the only e-mail sent during normal work hours. In the future I will post in the evenings or early morning. I would ask that you not let this activity interfere with your work either. Second, I would ask that you prayerfully consider before you invite someone else to join. This endeavor is specifically for mature believers. In closing I want to share a scripture that really impacted me the other day. I bought a very small bible for traveling so I can have it with me at all times. It is an NLT translation. The verse is from 1 Corintians 4:20 For the kingdom of God is not just a lot of talk; it is living by God’s power. That is my prayer today for each of us, that people can see the kingdom of God in our lives because we are living by His power.